Our new EP is available now! In association with the Ace Cafe, we are very proud to offer you this fine collection of music. 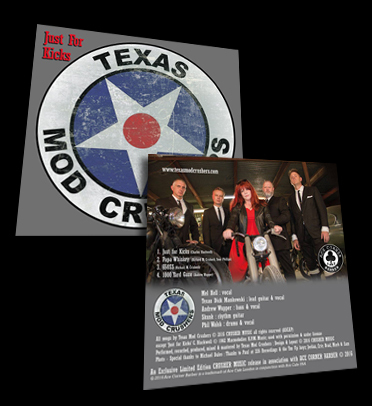 It includes four good-time rock ‘n’ roll songs that will transport you to the heart of Texas via London and Lancashire. “Just for Kicks” is the classic rocker anthem of the 60s, originally recorded by Mike Sarne. We’ve increased the tempo and replaced the saxophones with guitars, but the spirit remains intact. “Papa Whiskey” is about one of our musical heroes. He’s never obvious, but you will know who it is by the time the outro comes around. “650SS” is an old-school “car” song, in the tradition of “Little GTO,” and “Hot Rod Lincoln,” but this one is about the greatest mass-produced cafe racer motorcycle ever, the Norton 650SS. “1,000 Yard Gaze” is a commentary on the things we have to do to get through every day. It’s primal guitar therapy. Note: shipping costs only apply to continental USA. 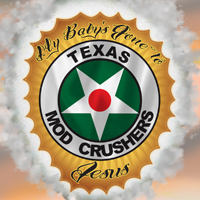 For other locations, please email info@texasmodcrushers.com. 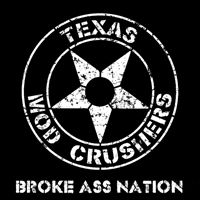 We also have another couple songs available for digital download here.